Originally introduced to the U.S. market in 1975 as a replacement for the Beetle, the Volkswagen Rabbit disappeared after a relatively successful 10 year run. At that time the "Golf" moniker was attached to what was, in essence, the same vehicle. 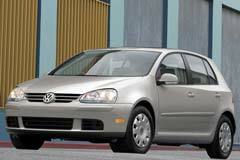 In 2006 the "Golf" was rechristened the "Rabbit" until its discontinuation after 2009. Buying a used Volkswagen Rabbit is typically regarded as a sound choice given the German automakers high standards. Its overall reliability and performance have consistently been rated as strong. Other positive factors include fuel efficiency and even cabin space, considering its overall size. The functional hatchback affords plenty of cargo room as well. With its reintroduction in 2006, the Volkswagen Rabbit came equipped with an inline 5 cylinder engine versus earlier models that were 4 cylinder. When considering the purchase of a used Volkswagen Rabbit be sure to check for some of the upgrades such as heated seats and a premium audio system. A used Volkswagen Rabbit is a practical and well rounded economy car. It provides a comfortable ride and the handling characteristics are more reminiscent of those found in a fancier sports car. 2008 Rabbit S 2008 Volkswagen Rabbit, Tornado Red with 108394 Miles available now!